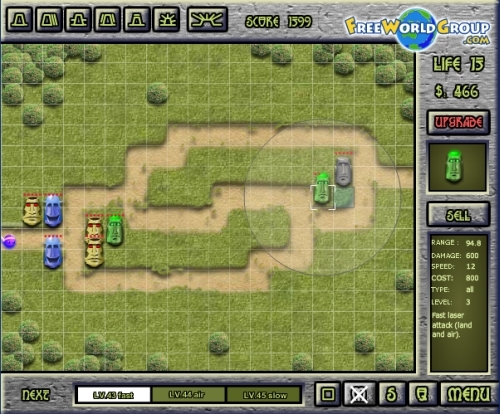 Easter Island TD is very nice tower defense from FreeWorldGroup.com. You are defending Easter Island with help of stone heads. Normal Head is the basic weapon against land units. Moving Head is good weapon against both type of units. After upgrading it is able to move. Splash Damage Head is a good weapon against land units. It has splash damage. Slowing Head is attacking and slowing land and air units. It is very usable for higher levels, to slow fast enemies. Anti-Air Head attacks only air units with splash damage. Laser Head is the best weapon in the game. It can attack both land and air units, with good damage and it has also good range and speed. It is impossible to finish the game without this weapon. Volcano is not weapon, but it can help you in case of emergency. It kill all enemies at the map with erupting volcano. You can upgrade all heads 5 times. Or you can sold them for lower price. Easter Island TD has very good designed game engine. You can choose from 3 difficulties. Each difficulty has its own map. The game has background music, but it is possible to stop it. The game engine also contains next waves info stripe. 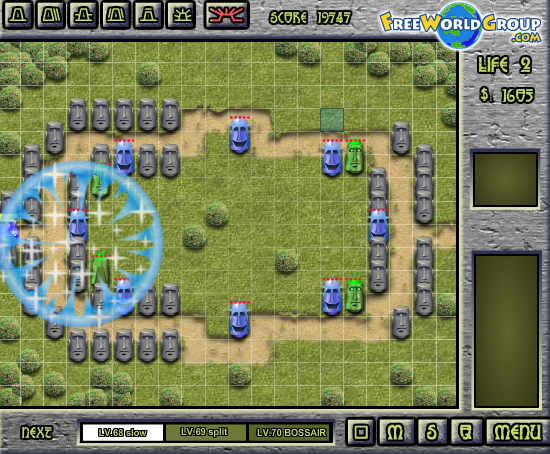 Easter Island TD is nice tower defense game with very good playability. It is a little bit easy, but I am sure that you will spend nice time with this game. I am giving this game 7.0 points from 10. Does anyone have any helpful hints to get through the HARD level? I agree... I can't get through it either, after MANY attempts. Level 37 is about how far ik can come. yes, it is possible to win hard level. Though we may look at it again if people struggle too hard. ... still looking 4 a hard level working strat. Jah i did it. killing the bosses in level 48 and 50 is the key. What is the strategy for beating hard mode? Can anyone who has gotten even halfway through the hard level give some hints, hopefully a screenshot of your defenses? Medium is now way too easy for me but I can't even kill the bosses except the first, maybe second one on hard and always get stuck by level 30. What is the best firepower per $ to use, I always run out of firepower (money) even trying to hold off and gain interest? Basically I think there should be at least 4 skill levels instead of 3, one level inbetween this medium and hard, or a mercy button that gives you more lives. Could someone give a strategy for beating hard mode? I cannot get it!! I had every possible position on the board filled with grey heads except for all remaining funds spent on green heads and STILL did not have enough firepower for past level 30-something on the hard level. I appreciate the anonymous reply but it leaves out a few important details needed to make it work, I was already getting to the middle levels it's the higher ones that are a problem. Thank you very much for the hard level purchase strategy. Following it fairly closely I beat the hard level for the first time ever, on the first try. The secret I was missing was that upgraded blue heads, and more of them, have a cumulative additional slowing of the enemy, so for me the key was buying twice as many blue heads and previously I wasn't upgrading them. I was also trying to use yellow heads previously but didn't buy any this time. Now I can move on to Canyon TD, lol. next to entrance. Put gray heads at corners where they have more range. 25 - upgrade green head at exit again, you will lose 2-3 lives but it's ok.
for an idea where heads are and how much they're upgraded at this point. Note how the selected green head has a large range that gradually grew from prior kills to cover both the top and bottom paths to the exit. When adding new heads put them in line with these 4 heads closer to the middle of the playing field and upgraded to max so their range already covers the top and bottom path a little. You should have roughly $14,000 at this point if all went well. Use volcano if your existing 4 green heads aren't enough to kill the bossair by themselves. 55 - buy green head one square after those at the entrance, upgrade to max. 56 - Doesn't matter much what you do now, upgrade the 6 existing green heads to max one at a time, leaving some money to draw interest. HA! HA!! I (you) can beat the hard level even WITHOUT the green lazer heads!!! Now you will go crazy trying!! but it can be done! Of course.... I'm much smarter than you. Try creating an excel spreadsheet of power,range ,speed vs $$$ and increase /$$ it will help. If I get good comments I will post hints. PS the I'm smarter comment was just to piss you off and motivate you! Comments? To do it the eazy way..
MAx blue "freezes" enemies and therefor multiplies the effectivness of any weapon. Max green and blue is the key for the ez way. The most important thing to do to beat the hard level is to either play enough times you get a feeling for, or keep track of past results, the bare minimum you can spend to get through a level. It is very very helpful to spend the least amount possible in the early rounds of the hard level. This way by building up a savings you draw interest at the end of each round which is MUCH more money than you gain by killing the enemy. Another tip - position your defenses so that after their range grows from upgrades (AND their range grows from kills too! ), that range covers as much of the path as possible, but put your most powerful pieces in the middle at beginning and end of the paths instead of using up valuable positions with weaker defenses. Another tip - use the volcano instead of spending over $100.something to increase your defenses, EXCEPT for the first half of the hard level, for the first half save the volcano for the air rounds. Another tip - you will usually need to upgrade at the Split levels, they are significantly harder than each successive level became in difficult. Another tip - the link at the end of the game to high scores like 80,000 points? The scoring system is broken, when you are good at the game you will score higher and higher instead of just completing the hard level, I noticed over 100,000 point games but it still won't show up on the website as that score due to being broken scoring reporting. To me, not just winning but getting a really high score is more important than trying to do it without green laser heads. Green laser heads rule, and they make a less annoying sound to listen to during gameplay... and yes I know you can turn sound off but I'd rather hear lasers lol.